A silky and luxurious, ultra-hydrating crème designed to improve natural functions of the skin in the delicate area around the eye. Our revolutionary Eye Treatment Crème, a proprietary complex of anti-inflammatory ingredients, helps strengthen the tissue around the eye, diminish the appearance of dark circles and puffiness, soften lines and wrinkles, and reveal healthier, more revitalized skin. - Elk Antler Velvet: Powerful cell growth factors which aid in cell development and cell regeneration. EVA contains essential amino acids which are the building blocks of protien. Smooths the appearance of lines and wrinkles instantly and over time. - Apolactoferrin: Increases natural hyaluronic acid production for immediate and long lasting hydration. Helps to eliminate dark spots. - Plant Stem Cells: Brightens skin instantly while it evens out skin tone over time. Reduces the appearance of dark circles. > Which Innarah product is better for you? Apply a small amount to orbital eye area. Pat gently until absorbed. Can be used day and night. Structured Water, Urucum Oil ( Bixa Orellana Seed Oil), Murumuru Butter (Astrocaryum Murumuru), Mango Butter (Mangifera Indica), Phosolipids (Lineoleamidopropyl PG-Dimonium Chloride Phosphate), Embilica ( Embilica Officinalis Fruit), Hyluronic Acid, Tripleuerospermum Martitum Ext., Marine Phytoplankton, Elk Antler Velvet, Apolactoferrin, Mangosteen (garcinia mangostana pericarp), Lactobacillus, Omega 3 (Oleth-3) VenoDefense™ ,(Dipeptide Diaminobutyryl Benzylamide Diacetate Polysorbate), Magnolia Tree Bark, (Magnolia Grandiflora Bark Extract), Alpine Rose, (Rhododendron Ferrugineum Leaf Ext), , Lactic Acid, Morus Bambycis Root Ext., Licorice Root Ext. Glycyrrhiza Glabra, Arctostaphylos, Uva Ursi Leaf Ext., Resveratrol (Hydroxyresveratrol), Mitracarpe, Mulberry Ext., Glucosamine, Acetyl Glucosamine, Lupine Ext., Flax Ext., Aragan oil (Argania Spinosa Kernel Oil), Acetyl Hexapeptide, Algae Ext., Pullulan, Aureobasidium Pullalans Ferment, Acaia Seed Oil Ext. 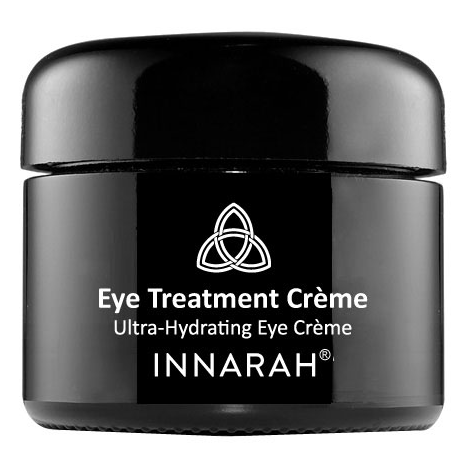 The Innarah Eye Treatment Crème is the second product of the range that I have been very fortunate to trial. Innarah is a range that I have not used before, mainly and regrettably due to the rather high price tags attached their products. This said, I will always attempt to ‘stretch’ my budget if I find a hero product that addresses my ageing concerns. I am relatively lucky not to suffer many lines around my eye area even approaching my mid-forties, however, sensitivity due to long hours spent in front a computer and allergies are an issue for me and I regularly suffer from irritation and puffiness in the eye area. Because of this I have to be extremely careful when selecting eye products. My first thoughts were pure excitement as this sounds like the perfect product for me! The Crème is said to have anti-inflammatory and anti-oxidant benefits and contains a stunning array of vitamins and minerals. Perhaps one of the most intriguing ingredients is ‘Elk Antler Velvet’. This immediately had me running to the internet to research this ingredient. The trust WWW provided this information..
Innarah states that no animal testing has occurred and I have it on good authority that our lovely Elks are not harmed during the harvesting of the velvet (thank goodness). After my research I was excited to begin my trial. The Crème itself arrived in a small travel size pot and inside there is a slightly off white crème based product. The Crème has a slightly gel like feel. The medium consistency makes it easy to dab your finger into the pot to remove the product. After researching the full size product I note that this is also housed in a pot. I am not a big fan of this type of dispenser for eye products and dipping a finger into any product can cause contamination and over use. The price tag of this Crème would justify a pump dispense in my opinion. The Crème is fragrance and colour free which is perfect for a high quality eye treatment. 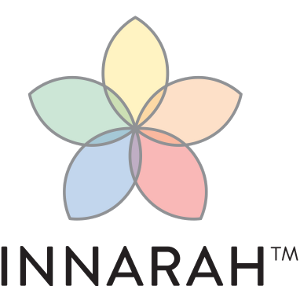 Many products that claim to be fragrance free often have an underlying scent but Innarah’s Crème is truly ‘scentless’! The Crème is very easy to apply and glides on beautifully without fuss. There is an instant soothing and refreshing feel and the delicate skin around my eyes readily absorbed the product without leaving a tacky and oily residue. Innarah states that there is an instant visual reduction in fine lines. I did not note this but was very impressed with the lightweight refreshing formula. My makeup applied easily over the top. I am usually very sensitive to crème based eye products and often find that they cause puffiness. This did not happen at all with this product and I was thrilled. Considering it claims to have an anti-oxidant and ant-inflammatory action this got 100% marks for me. Over a few weeks I have indeed noticed a reduction in puffiness and my eye area is sufficiently hydrated. I have not noted, sadly, a reduction in the fine lines however. All in all, this treatment cream really is a delightful and effective product, which offers most of the stated benefits. There are visible results and for me this was mainly a reduction in sensitivity and puffiness. Would I be willing to part with £97.00 for 15ml of this product….well sadly I would not. For ladies or gentlemen that have no strings on their purses or wallets I would say a hearty YES but for me, the results of this product needed to bring a little more to the table to encourage me to purchase a full size product at price. "The Innarah Eye Treatment Crème is the second product of the range that I have been very fortunate to trial. Innarah is a range that..."